Selecting the right leak detector to meet requirements of a production leak testing application can be a struggle for engineers and the whole process can be confusing and overwhelming at times. There are many leak detection methods and techniques available, yet when the leak rate requirement is between 10-4 down to 10-10 atm.cc/sec in a production environment, tracer gas methods are the only solutions that deliver accurate and repeatable results. Furthermore, if the leak rate is between 10-6 and 10-10 atm.cc/sec, helium leak detection is the only option available. The goal of this article is to cover the critical parameters that will help in selecting and implementing the right helium leak detector and its implementation. Our scope will cover what is commonly called the helium hard vacuum method. This method can be implemented using an inside-out approach (detecting helium “out-leakage” of the part under test) or using an outside-in approach (measuring the helium “in-leakage” of the part). To get a better understanding of the selection process, let’s first review the leak test process itself. A helium leak test cycle can be broken down in two primary phases, the pump down step and the helium measurement step. The pump down time is the time required to achieve a specific vacuum level inside the part or inside the test chamber where a pressurized part is placed (depending on the approach—“in-leakage” vs “out-leakage”). The pump down phase is performed by a vacuum pump (dry or wet technology). The part or the test chamber is first evacuated by the vacuum pump. Once the desired test pressure is reached, the helium leak test can be performed. The amount of helium leaking in or out of the part is then measured by the leak detector analyzer cell and displayed on the leak detector operator interface. When a part is connected at the inlet of a leak detector, the vacuum pump, often called roughing pump, will evacuate the part until it reaches a vacuum level that allows the leak detector to go into gross test mode. This vacuum level is called the inlet test pressure. 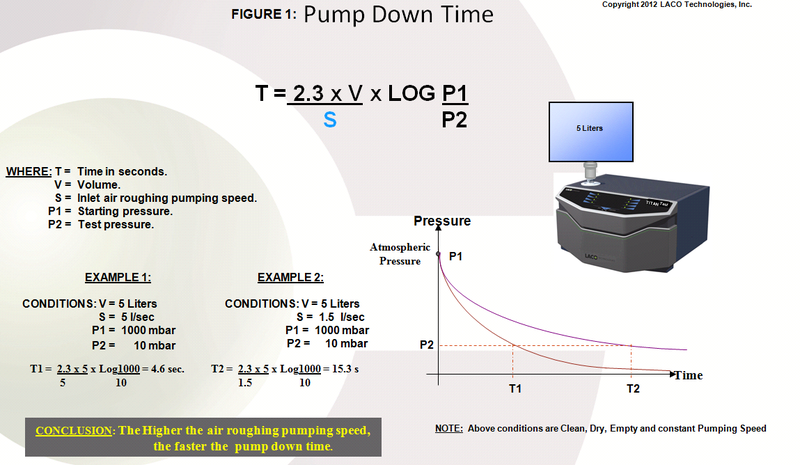 The formula in Figure 1 shows that the higher the roughing pumping speed of the rough vacuum pump, the faster it is to achieve a specific vacuum level. Usually, a leak detector has several leak test modes—gross, medium and fine. The gross leak test port is most often connected at the exhaust of the high vacuum pump. The vacuum level maximum inlet test pressure for gross leak mode typically varies between 25 mbar (best case scenario) to 1 mbar, depending on the model. 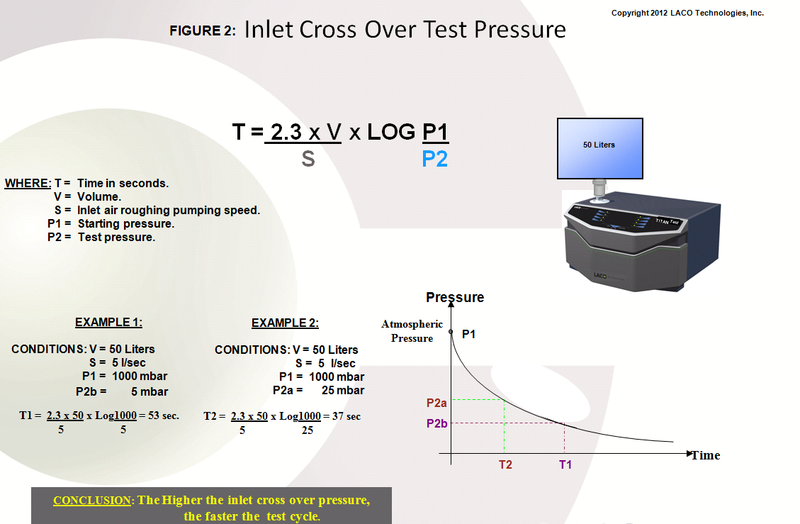 The higher the maximum inlet test cross over test pressure, the faster a gross leak can be performed. (see Figure 2). In many cases it is not possible to place the part directly at the inlet of the leak detector. A vacuum line is then used to connect the two. The pump down time can also be affected by the type of vacuum line connecting the leak detector and the part. In vacuum, the ability of a vacuum line to allow the gas to flow through is called the conductance. The larger the conductance, the faster the gas transfers from the part or test chamber to the leak detector, hence the importance of selecting the right size vacuum line. In the world of vacuum there are four vacuum gas flow regimes. For the sake of simplicity we will only focus on two of them—the viscous and the molecular regimes. The first one is encountered during the roughing pump down phase and the second one is usually met when the leak detector is in fine leak test mode. The vacuum regime inside the vacuum line normally transitions from viscous to molecular regime during the complete leak test cycle, when going from atmospheric pressure down to 10-3 mbar (or lower). Figure 3 and Figure 4 show the corresponding formula for the conductance in both regimes. The impact of the conductance will be much greater in molecular than viscous regime and great care should given in the selection of the vacuum line. Conductance for air and helium in molecular regime can be easily calculated as they only depend on the physical dimensions of the vacuum line. Continue reading: Part 2 of “How to Select and Implement a Leak Detector” which will cover the following topics: Response Time to a Helium Signal, Test Fixture and Part Handling, and Helium Management.